[185 Pages Report] The free space optics (FSO) market is expected to grow from USD 0.15 billion in 2017 to USD 1.45 billion by 2023, at a CAGR of 39.58% between 2018 and 2023. 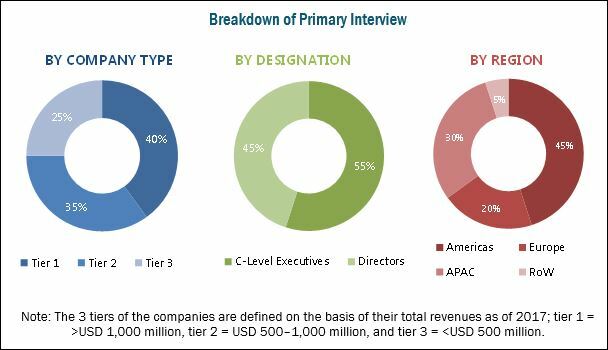 Factors driving the growth of the FSO market include last-mile connectivity, no licensing, and alternative solution to overburdened RF technology for outdoor networking. The visible light communication (VLC) market is expected to grow from USD 1.30 billion in 2017 to USD 75.00 billion by 2023, at a CAGR of 96.57% between 2018 and 2023. Factors driving this growth are faster and safer data transfer, RF spectrum bandwidth crunch, and less energy consumption. Data transmission is more secure and achieves high data rates compared to conventional wireless technologies, such as Wi-Fi, Bluetooth, Worldwide Interoperability for Microwave Access (WiMAX), and so on, which use radio waves for the communication. Light waves do not penetrate through walls; hence, they cannot be intercepted and misused. A networking speed of 100 Mbps can easily be obtained with VLC technology using LEDs. However, to compete with the existing communication technologies, VLC has to differentiate itself by providing a downloading speed of 1 Gbps or more compared to other wireless communication technologies. This can be achieved by parallel data transmission from a number of LEDs. VLC technology is a greener, cleaner, and safer technology as it produces no hazardous emissions, unlike RF, and is also biologically safe. Moreover, VLC technology is interference-free, which means it does not generate electromagnetic interference as is produced by RF systems. Therefore, it can be used in areas where RF wireless communications are not permitted, such as in hospitals, chemical plants, or on oil rigs or underwater. Thus, faster and safer data communication than other competing technologies is the major driving factor for the VLC technology. How is Li-Fi secure than other wireless technologies? 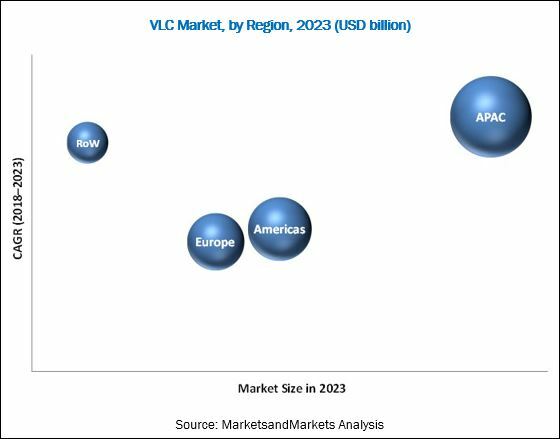 What are the key inorganic growth strategies being adopted by the industry players to grow in the VLC market? What are the key opportunities to grow in the FSO and VLC market? This report provides valuable insights on the FSO and VLC ecosystem, which includes research, design, and development; original equipment manufacturers (OEM); software service provider; network service provider; technology integrator; and end users. Organizations involved in the R&D of VLC are Ecma International (Switzerland), Fraunhofer HHI (Germany), University of Strathclyde (UK), IDeTIC (Spain), Nakagawa Laboratories (Japan), Smart Lighting Engineering Research Center (US), Rensselaer Polytechnic Institute (US), Visible Light Communications Association (Japan), University of California (US), Oxford University (UK), and University of Edinburgh (UK), among others. Major OEMs of FSO are Wireless Excellence (UK), Communication by light (Germany), fSONA Networks (Canada), LightPointe Communications (US), PAV Data (UK), Plaintree Systems (Canada), Optelix Wireless (South Africa), and Canon (Japan). OEMs of VLC are Oledcomm (France), Lucibel (France), Acuity Brands (US), General Electric (US), Signify Holding (Netherlands), LG Innotek (South Korea), LightBee (Spain), Outstanding Technology Company (Japan), pureLiFi (UK), Supreme Architecture (US), IBSENtelecom (Norway), Fujitsu (Japan), and Panasonic (Japan). Companies developing applications for VLC are General Electric (US), Signify Holding (Netherlands), Oledcomm (France), Fujitsu (Japan), and Panasonic (Japan). Signify Holding (Netherlands), Acuity Brands (US), General Electric (US), and LVX System (US) are some of the well-known network service providers of VLC. The study answers several questions for the stakeholders, primarily, which market segments to focus on in the next 2–5 years (depending on the range of the forecast period) for prioritizing the efforts and investments. In this report, the FSO and VLC market has been segmented based on the following categories. The free space optics (FSO) market is expected to grow from USD 0.27 billion in 2018 to USD 1.45 billion by 2023, at a CAGR of 39.58% between 2018 and 2023. Factors driving the growth of the FSO market include last-mile connectivity, no licensing, and alternative solutions to overburdened RF technology for outdoor networking. The visible light communication (VLC) market is expected to grow from USD 2.56 billion in 2018 to USD 75.00 billion by 2023, at a CAGR of 96.57% between 2018 and 2023. Key factors driving this growth are faster and safer data transfer, RF spectrum bandwidth crunch, and less energy consumption. 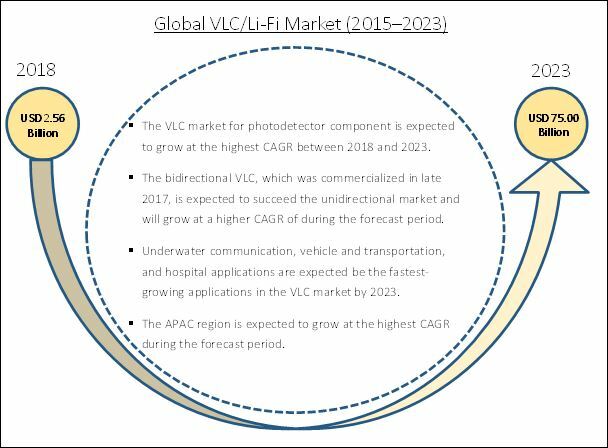 The VLC market has been segmented into different components LED, photodetector, microcontroller, and software. Software is the major component of the VLC system, and it is expected to dominate the VLC market during the forecast period. This is mainly because the two-way communication by VLC technology would allow all the electronic devices to communicate with each other and would require efficient software support. The market for photodetector is expected to grow at the highest CAGR between 2018 and 2023. This growth is attributed to the commercialization of bidirectional VLC. Photodetector will enable Li-Fi to function as a bidirectional communication system (like a conventional broadband and Wi-Fi). The bidirectional VLC, which was commercialized in late 2017, is expected to succeed the unidirectional market and is expected to grow at a higher CAGR during the forecast period. The full utilization of special features of VLC is possible only with bidirectional transmission; hence, the technology will be adopted by all major verticals. The market will grow tremendously and surpass the unidirectional transmission type market. The FSO and VLC markets have also been segmented on the basis of application. Among all the major applications of FSO, the mobile backhaul application is expected to account for the largest share during the forecast period. The VLC market for consumer electronics is expected to hold the largest share by 2023. The FSO and VLC markets for healthcare and hazardous environment applications are expected to grow at the highest rate during 2018–2023. The Americas is expected to hold the largest share of the FSO and VLC market during the forecast period. This is due to the huge investments in telecom infrastructure, government funding, and increasing military expenditure in FSO technology; and the government funding and deployment of several VLC systems in public and commercial places. 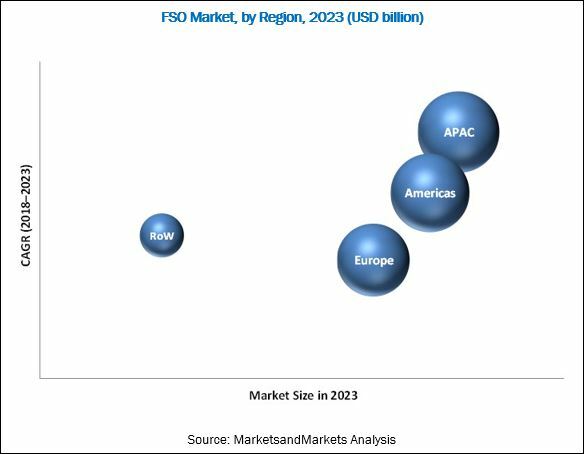 The FSO market in APAC is expected to grow at the highest CAGR during 2018–2023. Increasing manufacturing facilities, advanced infrastructure, and the growing computer-aided design (CAD) industry are driving the FSO market in APAC. The VLC market in APAC is expected to grow at the highest CAGR due to recent developments and increased expenditure on VLC-related R&D activities in APAC. The hazardous environment application is expected to be the fastest-growing application in the VLC market during the forecast period. Underwater communication, vehicle and transportation, and hospital applications are expected be among the fastest-growing applications in the VLC market by 2023. In 2015, one-way communication based on the VLC technology was commercialized for applications such as street light, smart store, and museum. In 2017, two-way communication based on the VLC technology, that is, Li-Fi, was commercialized for hospitals, offices, and several other indoor applications. Consumer electronics used in homes and offices can be interconnected with the help of VLC technology to realize the concept of IoT in smart homes and smart offices. All consumer electronic products with LEDs such as smart phones, tablets, laptops, PCs, TVs, cameras, and others can be used as connected devices and made to communicate with each other with the help of LED lighting. Indoor networking or home networking is possible with the help of other wireless technologies such as Wi-Fi, 3G, and Wimax among others. Li-Fi acts as a complement to Wi-Fi technology and can be implemented in the existing communication system with very low additional expenditure. Given the requirement for secure communication technology, VLC is emerging as the ideal technology for the defense and security application. As VLC can operate within LoS and the data cannot be detected on the other side of the wall, this technology is a secure way of communication. Especially in the defense sector, there is a requirement for secure data transmission that cannot be intercepted by any intruder or enemy troops, for which VLC proves most useful. Apart from the security feature, the high transmission speed of VLC systems is another feature that makes it useful for the defense and security application. VLC can be used in vehicle- and transportation-related applications such as vehicle-to-vehicle (V2V) communication, location-based services (LBS), and intelligent transportation systems (ITS). For vehicle and transportation applications, there is a requirement for both one-way and two-way communications, based on the use cases. VLC helps reduce the cost of automotive applications such as ITS, as the installation cost of VLC system is comparatively lesser than that of other technologies. This is because of the existence of lighting in infrastructures, vehicles, streets, and signals. VLC can also avoid the problem of electromagnetic compatibility in ITS, which is a serious issue in RF technology. VLC caters to many parts of the healthcare industry. There are many benefits of using VLC in hospitals, such as asset tracking, patient tracking, and data monitoring. As other technologies such as RF cannot be used in operation theaters and near magnetic resonance imaging (MRI) scanners due to harmful frequencies, VLC technology is gaining traction in hospitals. VLC can be used for this purpose because it neither generates any harmful waves nor causes electromagnetic interference. Communication has always been a major problem in hazardous environments such as mines, petrochemical plants, and oil ridges. The use of RF or any other wireless communication technology is not possible in such environment as it poses a threat of explosion. However, VLC uses LEDs for the purpose of transmission, which is naturally safe for both communication and lighting purposes. High installation cost of FSO technology-based devices is a hindrance for the wide level adoption of FSO systems. Furthermore, for the FSO market, reliability issues due to fading of signals during propagation act as a challenge. The dominance of competing technologies and requirement of direct LOS inhibits the growth of the VLC market. Furthermore, for the VLC market, lack of awareness about the technology and lack of common standards are the challenging factors. Major players in the FSO market are LightPointe Communications (US), fSONA Networks (Canada), Wireless Excellence (UK), Plaintree Systems (Canada), and Trimble Hungary (Hungary) among others. Key players of the VLC market are Signify Holding (Netherlands), Oledcomm (France), Lucibel (France), pureLiFi (UK), Acuity Brands (US), General Electric (US), Fraunhofer HHI (Germany), LVX System (US), Panasonic (Japan), and IBSENtelecom (Norway). How Li-Fi will change the consumer electronics industry? Which applications would adopt Li-Fi technology drastically in the coming future? Will Li-Fi be an alternative to Wi-Fi or beacons? For which applications the companies can leverage the Li-Fi technology?